The decision on which ramen shop should be posted first in ramen-otaku was a no-brainer. My first ramen experience in Tokyo was Kyushu Jangara, thanks to Okunuki-san for introducing me to ramen heaven. And while I may over use that word when it comes to ramen, Jangara's track record speaks for itself. 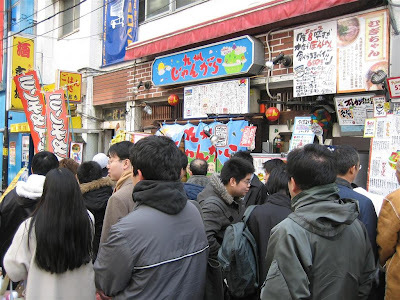 It was voted as the most popular ramen shop in the Tokyo Metropolitan area in 2003, and at the three locations I've been, there is usually a line during meal hours. Before we get to my experience, Jangara ramen is based from Fukuoka, and it is also known as Hakata ramen, with a tonkotsu soup base. Tonkotsu soup base is made from pork bone, and most of my friends who are ramen fans all love the tonkotsu soup base. 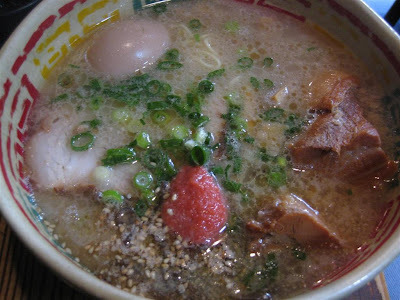 It is easy to understand why many ramen fans like tonkotsu, and Jangara is a perfect example. They put the time and effort into make the soup, and it takes hours to extract all the flavor from pork bones to make the soup and give it its texture and taste. Jangara has six ramen options, Kyushu Jangara (original soup), Jangara Miso (my favorite), Bonshan (more fatty), Kobonshan (medium fatty), Karabon (spicy), Mugichan (not sure what this one is). There also have Tsukechan, which is tsukemen (will talk about in detail in future posts), but I have yet to be tempted enough to try them. My first Jangara experience was at the Akihabara shop, which perhaps is the smallest one they have. Being my first time and the first bowl of ramen I was going to have, I ordered the standard Jangara ramen, with the 'zenbu' option that included all the toppings. I knew after the first sip of the soup that I would be a tonkotsu ramen fan. The soup was so rich, so flavorful, you and the toppings are also amazing. A bowl of ramen at Jangara packs a lot of flavor, so it's not for those who have mild taste buds. 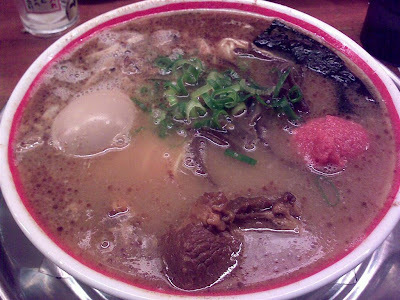 Another distinction of Hakata ramen is the noodles. 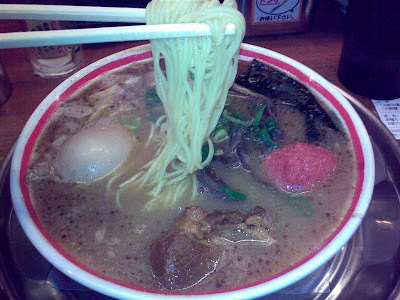 Ramen from the Fukuoka region all feature thinner, at times a bit more harder noodles, and this is tradition. I actually prefer the thinner noodles over the thicker ones that are featured in Tokyo-based ramen. Not that one is better than the other, it is simply a matter of preference. Typically the noodles are not cooked for a long time, and it comes out a little harder, so if you like them softer, you'll have to tell them. I have visited the Akihabara and Nihonbashi locations. Go to the Akihabara location for the experience, but Nihonbashi is much more spacious and not so cramped. Not all the ramen options are available at every shop, but the standard ones should be. While there are other ramen shops that feature different options, different soup base, I can say that there hasn't been anyone that I know who was disappointed with Jangara. My mouth is watering just writing this, thinking about the soup, noodles, and toppings. If you are in the Tokyo area, this is a must try!